I tried to go into this sequel to the re-boot with an open mind, but it wasn't easy as my enthusiasm for the Spider-Man franchise is at an all-time low these days. I so wasn't into Marc Webb's first entry 2 summers ago; I wrote on this very blog that it seemed "more like a reconfigured remake than a brand new beginning." Well, the sequel is more of the same as it matches a lot of story beats from Sam Raimi's SPIDER-MAN 2 from 10 years ago. Andrew Garfield is back as the web-shooting super hero who is now haunted by the ghost of NYC Police Captain George Stacy (Denis Leary), who I forgot had died in the first one (shows how much it left my memory). A flashback reminds us that Garfield's Peter Parker had promised Leary's Stacy that he would leave his daughter Gwen (Emma Stone) "out of it," so after a late entrance at their graduation - Spider-Man had to chase down a Russian mobster (Paul Giamatti) who had hijacked a truck filled with tons of Oscorp plutonium, you see - our conflicted protagonist breaks up with the love of his life. Meanwhile some half-assed villain origin stories are being set up concerning Peter's childhood friend Harry Osborn (Dane DeHaan), who we all know becomes the Green Goblin, and Jamie Foxx as a Oscorp maintenance man who has the bad luck to fall into a tank of genetically modified electric eels. This happenstance turns Foxx into a blue glowing electric generator that engages in a Times Square-set battle with Spider-Man that's one of the better sequences. Unfortunately its more MAN OF STEEL than SUPERMAN II as there's loads of messy bombastic destruction that had to cause some deaths but you never see them. Instead they cut to a comical shot of Spidey wearing a fireman's helmet and holding a running hose while firefighters are laughing it up all around him. 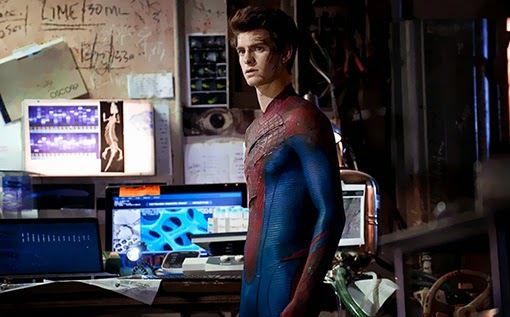 The plot gets messier with DeHaan scheming to get a transfusion of Spider-Man's blood to fight off his growing illness, Stone considering going to study at Oxford, and Garfield trying to solve a mystery left behind by his late father (Campbell Scott) involving a briefcase and a secret lab. Garfield does this by constructing a Homeland-style cork board of documents, pictures, notecards, press clippings, string tying them all together, etc. I bet that's not far off from how screenwriters Alex Kurtzman and Roberto Orci (STAR TREK INTO DARKNESS) along with Jeff Pinkner (James Vanderbilt is also given a story credit) constructed the screenplay. At an overstuffed 142 minutes, THE AMAZING SPIDER-MAN is tiresome and uninspired franchise filler. There is some charming chemistry between Garfield and Stone, who are dating in real life, but the insipid dialogue they're given sabotages them on almost every line. That's just one of many of the movie's problems. The humor feels off, Hans Zimmer's score is generically overwrought, Giamatti is too ridiculously over-the-top, the theme of Peter trying to sell the world (or at least his still unseen Editor J. Jonah Jameson) on Spider-Man being here to help is cheesily handled, Leary's ghost is a poor plot mechanism, Sally Field as Aunt May isn't given anything to do, and a major character getting killed (I'm not Spoiling who) doesn't have anywhere close to the emotional impact it's going for. Even the Stan Lee cameo falls flat. One of the film's few plusses is its design, and ace cinematography by Daniel Mindel. But even with the effects advancing further forward, Webb's SPIDER-MAN is still toiling in the aesthetics of the Raimi/Tobey Maguire trilogy. It's like they are content to stand in those superior chapters' shadow, without any motivation to put their own distinct stamp on the classic comic book character. Sony has unsurprisingly got SPIDER-MAN 3 and 4 already scheduled for 2016 and 2018 to fill the spaces between the more promising installments of the Marvel Universe (THE AVENGERS, IRON-MAN, CAPTAIN AMERICA, et al). This is really only good news to the diehard fanboys, because I bet the rest of us will think twice about ponying up for such subpar Spider-man entries like this one.